Iconic brand American Airlines has been replaced with a completely overhauled and modernized Corporate Identity, courtesy of Futurebrand. The classic eagle and tightly kerned letters have been replaced with more open text, and a new ‘flight’ icon that is a combination of the eagle, a star, a flag and wings all rolled into one. Interesting is the use of gradient and shading on the icon. Gone is the long red white and blue stripe down the side of the aircraft–new is the red white and blue ‘flag’ on the tails. Read more about the update at Creative Review. Since 1989 Robert and Erin Drake of Autobahn Automotive have been providing some of Raleigh’s best automotive service for Japanese and European import vehicles. Over the years, they’ve earned a loyal following of fans due to going the extra mile for their customers, with perks like a free loaner car, free car wash, and other promotions that keep them returning time and again. 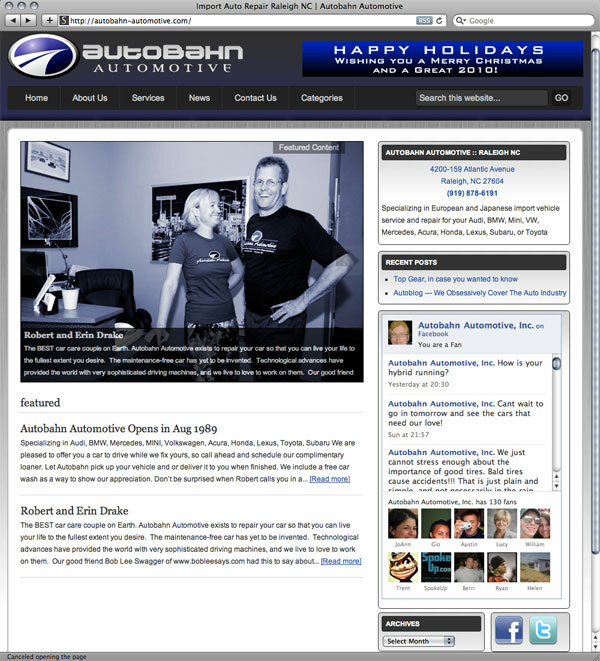 Raleigh Brand Design firm Killer Creative Group was recently asked to refresh Autobahn Automotive’s image and website. Autobahn has been very active in taking advantage of new Social Media such as Twitter and Facebook, and needed the ability to integrate those outlets, as well a needing the ability to add articles on automotive maintenance and related news to the site, with a budget-friendly solution. Rather than build a complex Content Management System (CMS), Killer Creative designed a solution using the open-source WordPress platform. WordPress is a good platform for firms looking for a mid-range website that need a small amount of customization but also allows for basic content updates without advanced programming skills. The new site at autobahn-automotive.com includes a status feed from the Autobahn Facebook Fan Page, a Twitter link, as well the ability to update news posts and articles at will, with commenting ability built in. Killer Creative also updated the logo design and extended the blue color theme throughout as well as an industrial brushed steel background. Raleigh WordPress web hosting provided by KillerHosting.net. These are the words written into the U.S. Constitution in the 5th Amendment, effectively saying that the government cannot take your private property without reimbursing you for fair value. Sometimes the fair value offered in a land condemnation hearing is questionable, and that is where Raleigh NC Eminent Domain law firm Emmett Boney Haywood comes in. Raleigh graphic design and branding firm Killer Creative Group recently rebranded the North Carolina law firm with an entirely new Corporate Identity, a stylized brushstroke ‘E’ that also symbolized rolling hills (or a leaf, depending on your point of view). The bold new look was also introduced into the firm’s new printed stationery and signage, as well as a complete redesign of the website which just launched. Eminent Domain and property law often delves back decades, sometimes much further back in time to determine the rightful deeds to the property in question—so history plays a large part in what the firm deals with on a daily basis. The look of the new site takes its design cues from the historical aspects of eminent domain and property law: historic maps, old deeds, cartographic flourishes and of course the U.S. Constitution all inspired the look of an old document or map. The result is a memorable, unique Identity that is different from the polished electronic feel of firm websites in the same category. 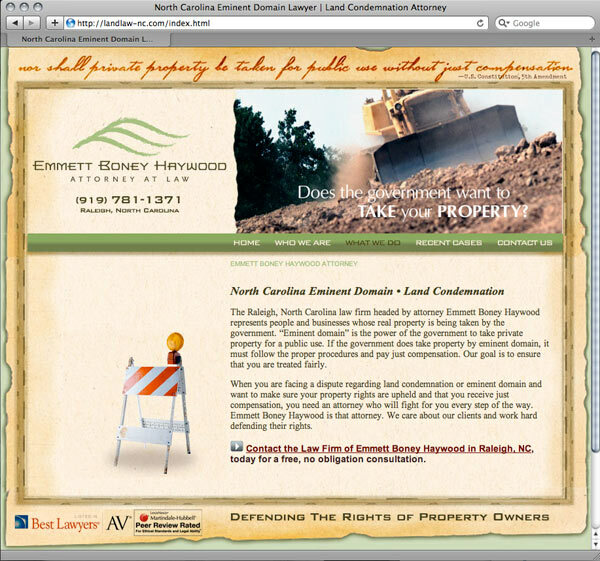 Visit the law firm of Emmett Boney Haywood at landlaw-nc.com.